To make sugared cranberries: Bring water and sugar to a boil in a saucepan. When sugar is dissolved, remove pan from stove and allow to cool until warm. Add the simple syrup to a bowl with fresh cranberries. Secure with a lid, place in refrigerator and allow to sit overnight. Remove cranberries from bowl and dry on a cooling rack for 1 hour. While cranberries dry, prep salad. Shred Brussels sprouts by sending them through the vegetable shoot on a food processor, or chop with a Chef’s knife. Place in a large bowl. To make dressing: Zest and juice lemons in to a bowl. Add honey and whisk in olive oil. Season to taste with salt and pepper. Thoroughly mix dressing with shredded Brussels sprouts. Top salad with crumbled goat cheese, crumbled crispy bacon and toasted walnuts. Place cranberries back in a bowl and toss with turbinado sugar until coated. 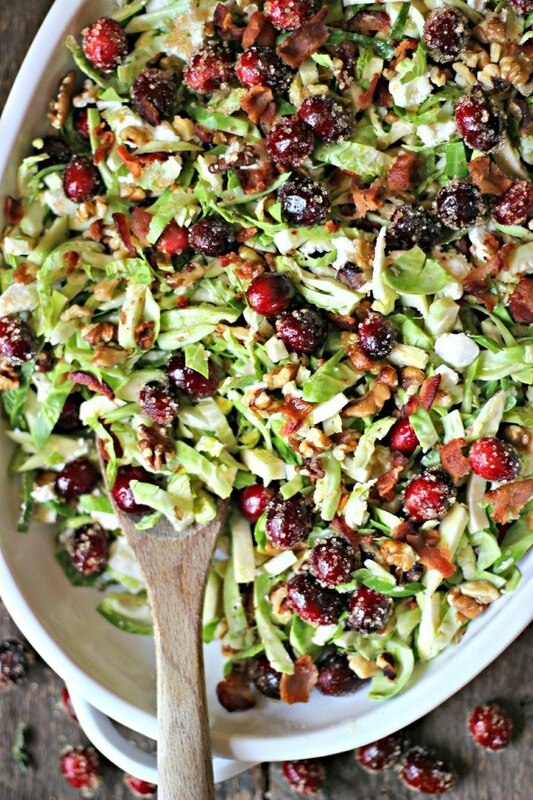 Place sugared cranberries on top of the salad. Enjoy!